I haven't completely forgotten about you, or food or recipes, but one of my goals for the summer is establishing a functional and user-friendly index for Cora Cooks. It is a little more time-consuming than I thought it would be, but I know we'll all love it when it's finished. I'm keeping my nose to the grindstone. Here's a little something to keep you occupied with some great ideas for food and other magical ways to have a happy summer. The response to last week's post with ideas I found on Pinterest was excellent, so here we go with round two. Once August rolls around, we begin to realize the days are already getting shorter and it won't be long until school starts again. I know I begin to think about squeezing every last drop of fun from those last few days. With that in mind, this week I found lots of clever crafts, cool ideas and easy-living tips on Pinterest to make the most of your summer days. Time-saving ways to make everyday free and easy -- for you, your kid(s), your neighbor kids, your grandkids or your guests. No one will be bored, everyone will be hydrated and happy, and you might even be able to squeeze in some quiet time of your own to read a steamy summer novel or take a nap. Nothing says summer like a good book and a nap! Sometimes a day at the beach is ... well ... not so much! Tons of paraphernalia to carry to and from, gritty sand in food, drinks and swimsuits, sunburn, tired cranky kids and that long drive home. 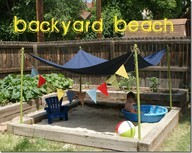 This little bit of a backyard beach is the answer to your prayers! 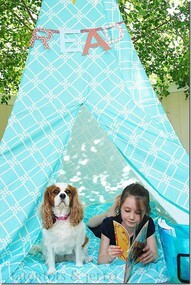 What a cute idea from the blog Better Together written by three very talented sisters. A day at the beach that ends with smiles all around. Yes, it's a beach ball -- and more! Very realistic and so much fun for a party. 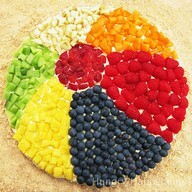 Beth from Hungry Happenings created this delicious beach ball fruit pizza with a sugar cookie crust, spread with lemon cheesecake filling and covered with beautiful, bright and refreshing fruit. Just perfect for summer dessert. Smile and say fruity cookie cheeeeeese-cake! Here is another idea for those cupcake liners we stored in the big glass jars last week. Martha Stewart Living had this on the website last summer and Annie at Marry You Me featured it as cocktail caps on her wedding blog from England. 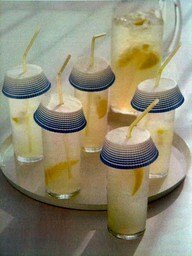 Perfect for cocktails, lemonade and canned drinks too! No more bees or bugs in drinks! Smile now if you've ever swallowed a bug! Laura at Come Together Kids shared a time-saving idea to keep them blowing bubbles all day long - this plastic drink dispenser will refill lots and lots of little bottles. 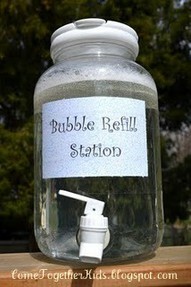 And she has a bonus for you too -- recipes for making large, inexpensive batches of bubbles at home. Moms must love Pinterest for all the terrific ideas from the cleverest mommy bloggers! Bubbles make everyone smile! Kids get bored ... and whine ... and complain ... and want to be entertained. Somewhat Simple has the solution! 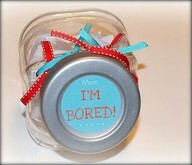 The I'm Bored Jar is filled with strips of paper printed with things to do. But here's the fun for mom ... it might say "bake cookies with Mom" or it might say "dust the living room." A sure cure for boredom either way! See mom smile! Oh, no! More cupcake liners! I can't believe 1) I've never thought of this simple solution myself and 2) I haven't got that big canister full of cupcake liners yet! 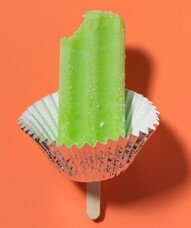 Real Simple included this idea in an article full of simple summer ideas to repurpose items you already have around the house. This one alone will save me hours of time with the my own laundry. Now I'm smiling! And last, but not least, something for quiet time from Tatertots and Jello. As a kid, I would have loved this. As a mom, my kid loved his. As a teacher, I know how much kids love to hole up in tiny spaces on the floor and read. Whether it's out in the yard or in a bedroom or playroom, this is the perfect space to encourage some quiet summer reading time. Is that mom smiling again?